Counsel Press’ Chicago location was founded in 1917 as Midwest Law Printing Company and later acquired by Counsel Press in 2008. 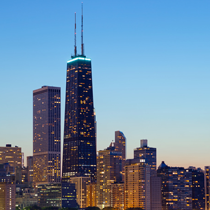 From this location we specialize in filing and service within the Illinois and Wisconsin state appellate courts and the United States Courts of Appeal for the Sixth, Seventh and Eighth Circuits. We also typeset, publish and print the official opinions for the Judges of the United States Court of Appeals for the Seventh Circuit.